In today’s world of sports specialization, pro athletes succeed because they’re very good at one particular position. 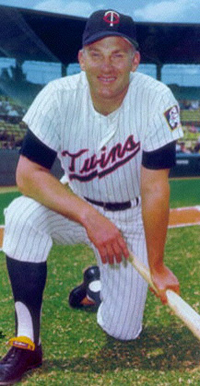 But Harmon Killebrew succeeded with the Minnesota Twins of the 1960s because he was able to fill whatever defensive hole the team needed filled…while performing at an All-Star level at the plate. Perhaps more than any player before or since, Harmon Killebrew was a one-man roster for the Minnesota Twins. The extent to which the team shuttled Killebrew around is absolutely amazing considering his offensive production. During his first full season with the Twins in 1959, they tried him at third base because he'd been an infielder in the minor leagues, but he committed 30 errors. So over the next two seasons he played less time at third and more time manning first base. Just when he seemed to find his natural position, rookie manager Sam Mele surprised his star and infield season ticket holders by shifting him to left field at the start of the 1962 season, in hopes that the stability would allow the slugger to concentrate on hitting. "Killer" responded with a spectacular batting season (48 homers and 126 RBIs) and all seemed well. Killebrew’s resurgence in the outfield, along with the emergence of young players Rich Rollins at third and Bobby Allison at first base, dictated that he would remain in Metropolitan Stadium’s cavernous fields for years to come. After all, like the crops in his native Idaho, he seemed to be thriving in the left field sun. He crushed 45 massive homers in ‘63 and exceeded his round-trip total with 49 (a career best) in ‘64. 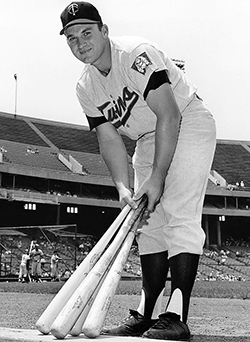 But the Twins wanted to get more at-bats for a young slugger named Don Mincher, who was even more defensively challenged than Killer had been in his early years. So Mincher was given the first base job, and with 1964 AL batting champion Tony Oliva in right field, Allison was moved to left. That meant Killebrew was without a position, again. Then, in one of the most debated personnel decisions in baseball history, the Twins platooned Killebrew at first and also give him a few starts at third base. Despite the distraction, he helped Minnesota take the pennant 1965 by knocking out a respectable 25 homers. He responded to the comparative stability by hitting 39 homers. But the Twin Two-Step wasn't near over. In 1967 Killebrew was back at first to fill the hole left by the departure of Mincher's (who hit only 14 homers the previous year) and two years later he was back at third base when, instead of asking 27-year old Reese or someone else to play third, they moved their star slugger, 33-year old Killebrew. 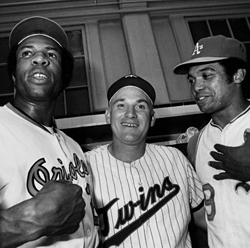 Killebrew responded by winning the MVP Award (49 HR, 140 RBI) and the Twins, of course, won the AL West title. Killebrew returned to the hot corner in 1970, and Minnesota repeated as AL West champions. In 1971, rookie third baseman Steve Braun came along and Killebrew was back at first base, where he remained the rest of his career, when he wasn't the DH. For his career, Killebrew played 969 games at first, 791 at third, 470 in the outfield (most LF), 158 at DH and 11 at second base (all before age 22). The Twinkies had used Killebrew to control their big problem in the 60s - they couldn't find an acceptable third sacker. It didn't seem to bother Harmon too much, since he won an MVP Award, led the AL in homers six times, and in RBI three times. Perhaps the most famous quote from Killebrew came in a candid moment after his playing days were over, when he told a reporter: "I didn't have evil intentions, but I guess I did have power."